Nikaya Buddhism is a general term for those schools of Buddhism that accept only the class of sutras collected in the Pāli Canon as authentic. Historically, there were many Nikaya schools, but only one still exists today: the Theravada. Nikaya Buddhism is distinguished from the Buddhism of the various Mahayana and Vajrayana schools, which accept the authenticity of a range of other scriptures. However, the sutras of Pali Canon are accepted by every school, and outside Nikaya Buddhism they are known as the agamas or Nikayas. 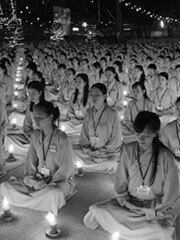 Many Western authors have used the term Hinayana to refer to Nikaya Buddhism. However, that term is now often seen as flawed on two levels. First, Hinayana, literally «inferior vehicle», is often regarded as an offensive or pejorative term and has never been used by Nikaya Buddhists to refer to themselves. Second, according to Mahayana and subsequent Vajrayana doctrine, «Hinayana» refers not to a sect or school of Buddhism but to a type of path to liberation which is contrasted with the path of the Bodhisattva. The term Shravakayana (literally, «the vehicle of hearers «) is sometimes substituted, but this meets only the first objection, and not the second. «Nikaya Buddhism», which appears to have been coined by Professor Masatoshi Nagatomi of Harvard University, is an attempt to find the most neutral and accurate way of referring to these schools. Note that nikaya is also a term used by Theravadins to refer to a school or sect. There were once at least eighteen Nikaya schools. According to tradition, the divisions within Nikaya Buddhism originated at the second Buddhist council, held about one hundred years after the Buddha’s death. The subject of this council involved adherence to monastic rules (vinaya). Tradition states that the protagonists were two Nikaya Buddhist groups: a conservative group known as Sthaviravada which insisted on strict observation of vinaya and a more liberal group known as Mahasangikas which argued that some minor rules could be relaxed. The council ended with the rejection of the Mahasanghikas. A series of further disputes resulted in additional divisions. The now-defunct Nikaya schools are described under early Buddhist schools and branches of Buddhism.